A family emergency sent me to Berlin. The trip back (which was filled with stress and eventually relief) was on British Airways Premium Economy – branded World Traveller Plus. Due to the circumstances of the trip I was not in a good mood. This almost certainly impacted my attitude toward the flight and the product and therefore this review. That said, it is clear that World Traveller Plus (WTP) is closer to economy than business. It is a product a little above economy but well below business. The problem is that the pricing (absent a deal/special) is mid way between Business and Economy. Therefore without a deal or pricing special then WTP is not worth the money - especially if your frequent flyer status already grants you access to premium check in and lounges. Not sure why and it was not a factor associated with World Traveller Plus, but this was the slowest boarding I have every experienced on a 747. BA was using one door rather than two but even so there was an annoying long delaying in boarding and chaos at the gate. It felt at times like a queue for Space Mountain at Disney land, each time I eventually came around a corner I thought that it would be the last one and I would get a glimpse of the door only to be disappointed and realise there was another stretch of the gate and corner to go around. My mood was also a factor due to the nature of the trip but also because Terminal 4 at Heathrow is an abandoned wasteland with construction, closed shops and poor facilities. The BA lounge is sub-par by any measure (against competitors, against other airports and against BA’s other offering in Terminal 5). On board there is no pre-flight drink or other offering from BA in this class. Combined this contributed to me reaching my seat in an even worse mood. There is a reason why the product of Premium Economy or World Traveller Plus is tied in its definition to the Economy product. The seat is a step above economy but it is not a leap above. Put another way this is not a product that sits in between the Economy Class and Business Class (Club World) products. Instead it is a noticeable but incremental improvement on economy. The extra seven inches of leg room is nice but not transformative. This means that you are more comfortable but is does not make for an ability to sleep for an entire sector (ie 7-8 hours). There were also some very annoying parts to the seat. Something (I think either the VOD unit or lifejacket) was placed under the seat in front in such a way that it impeded my ability to freely put my feet under the seat in front. For someone of my size (185 cm) the foot rest is useless (too high) and the leg rest is meaningless (does not come out far enough) so the benefit of the extra leg room comes from the ability to put my feet under the seat in front. This is not as possible in this BA product as it should be. Also annoying is the location of the Entertainment (VOD) remote control. I had this issue on Qantas economy also. The controller is at thy height in the arm rest. Means that each time I moved my legs, I hit the controller which paused, fast forwarded or otherwise messed up the movie I was watching. In the end had to store the controller in the magazine flap in back of the seat in front which was annoying for me and the passenger next to me when she tried to go to the bathroom. The service provided is attentive, punctual and functional but it is also procedural. That means I felt I was on the staff’s timetable with limited flexibility. I would have liked to have received a little more proactive service such as bringing me more drinks and walking around looking for passengers needing help. The trick to long haul Europe to Australia is to stay awake for the first sector and sleep for the second. That way your longest period of sleep ends with the early morning landing into Australia. This means staying awake for 12-13 hours. To do that I need a lot of support in drinks and other care. I feel there could have been more. I did like the dedicated cabin aspect. Regardless of food, seat and service, having less people fighting for air, toilets and attention is valuable. As with the seat, the food is a step above economy but two or three below business class. It is a one tray service, all packaged and very carbohydrate heavy. The last meal of the trip (breakfast) after 9 hours of flying from Bangkok was a “deli box” – something that should be more at home on a Sydney to Melbourne flight than a meal designed to break a six hour break without food. (3) turned off tow soon – 30 minutes before landing. 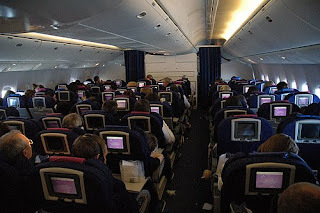 It my BA Business Class review (Club World) Review I expressed my annoyance that World Traveller Plus is located between door one and two giving WTP passengers a head start off the plane over business class. When in business class this annoyed me. Now I am in WTP, it is a nice bonus. BA’s other WTP twist is their “raid the larder” snack program where business and premium economy passengers can access a mini bar area with drinks, fruit, candy and sandwiches. This used to be one of my favourite parts of the BA premium product experience. But on this flight it was not as good as I remember. It could have been my grumpy mood but it did not look as enticing as previous flights. I concur. Have flown World Traveller Plus a few times. I've been underwhelmed each time and can safely say that I would have been equally (dis)satisfied in regular economy.